Limited-Edition Ampoule Sampler Set (a $44 value)! • 1x Hydra Plus- Plant-based Hyaluronic Acid and Bio-Glycerin provide moisture and smooth the skin, resulting in reduced dryness lines. • 1x Perfect Glow- Luminizing pigments help reflect light while Sugar Beet Extract reduces dryness lines. Perfection Peptide P3 activates rejuvenation, and Cacao Extract helps protect against blue light digital aging. • 1x Beauty Rescue- Marine polymers, polysaccharides, and sugar beet extract moisturizes, strengthen skin’s barrier, and help reduce dryness lines. • 1x Active Night- Black Truffle Extract calms the skin, while Black Algae Extract helps increase skin energy. Black Willow Bark Extract and Plankton Extract promote skin rejuvenation. • 1x Oxygen Plus- Encapsulated Oxygen and Vitamin E revitalize and rejuvenate the skin and help protect against free radicals. • 1x 3D Firming- Extracts of elderflower blossom and tropical almond combined with tannic acid and organic Silica helps help firm the appearance of skin tissue. Yellow Horned Poppy Extract helps remodel and firm facial contours. •1x Lift Express – Helps reduce the appearance of lines and wrinkles and produces a tangible physical firming effect. 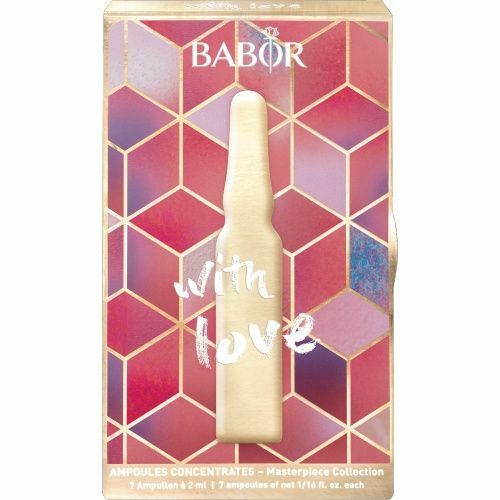 •Use after cleansing with BABOR CLEANSING products. •Shake the ampoule before use. •Wrap a tissue around the neck of the ampoule, grasp it firmly, and with a sharp movement snap it open at the lower, colored ring. Alternatively, use the enclosed ampoule opener. •Pour the concentrate into the palm of your hand and then smooth over your face, neck and décolleté. Pat gently and follow with a BABOR moisturizer. •Always apply the entire contents of the ampoule. •Use daily for 7 days.